MJ is addicted to writing, helping writers, and cats. She is an English teacher turned freelance writer and editor. New Adult Fiction, Author, Editor, Freelance Writer, Blogger. SFF Author, Teacher Gr. 4-12, Creative Writing Teacher/Coach, Editing, Theatre Production, Event Planning/Organizing. 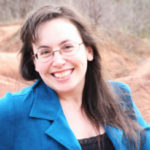 MJ Moores is a high school English teacher turned freelance writer, author, and editor (contemporary fiction, young adult, new adult, science fiction, fantasy). Since the birth of her son, writing is in fact the only thing keeping her sane as she casts aside a 10 year career to raise her only child. However, MJ will forever hold teaching near-and-dear to her heart as she continues to mentor and hold workshops on writing in the local community. MJ has published 2 SFF novels, 1 Anthology, 3 NF Industry eBooks, and has contributed to both Authors Publish Magazine and Indyfest Magazine, in addition to blogging for herself and others. MJ also runs a website for new and emerging authors, Infinite Pathways, which offers editing & publicity tips, guest contest (poetry, fiction, & opinion pieces), and author spotlights with reviews and interviews. For two years she ran a non-profit affiliate site called JUZDIZRTS, where she hosted author events (meet & greet, readings, & signings) twice annually. MJ’s most recent project transitioned her from small book events to large ones, as she coordinated the WCYR’s first book fair THE BOOKSHELF (2016) and plans to continue her efforts into the near future. While MJ has move a minimum of 15 times in her life, she will always consider “home” to her grandmother’s house — in a small community in North Mississauga — where her scholastic bent toward creative writing was nourished from the ripe age of 9. MJ currently lives in Peel Region North with her husband, son, and Wookie-cat.